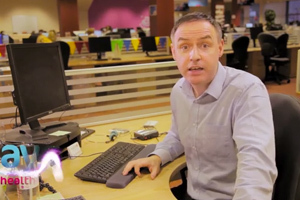 Avoid paying more for being over 34. If you are over 34 when you take out health insurance, you may have to pay extra for your cover. 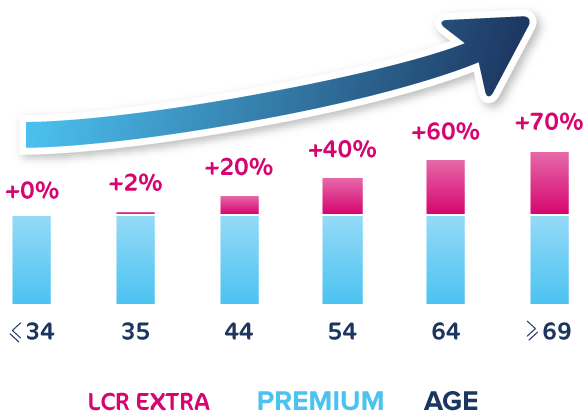 It works out at an extra 2% loading on to your premium for each year above 34, up to a maximum of 70%. We have a range of products available that will suit your needs, so click here to create your own scheme. Since 1st May 2015 anyone over 34 who buys health insurance will pay a loading on top of the price of their policy for life. So if you are over the age of 34, or your 35th birthday is approaching, then you should act now, as, the older you are taking out insurance, the more you are going to have to pay. Each year over the age of 34 that you put it off will cost you 2% more. Not a situation you want to be in is it? This cost will really add up. For example, if you take out a policy for €800 and you are 44 years old, you pay an extra 10% a year for your health insurance for life, or an additional €80, every year, based on that premium. But why would I take out health insurance in the first place? What you need to remember is that having health insurance is important to protect you and your family against the unexpected. Should you join Laya Healthcare, you will have peace of mind knowing that you’ll have quicker access to the best level of care, and depending on the policy you buy, you could also get money back against everyday medical expenses such as GP costs. So that’s money in your pocket at the end of the year. We also offer really good screening benefits to make sure anything that does go wrong is caught at the earliest possible time. Find out more on www.layahealthcare.ie . That all sounds fine, but why are the Government doing this? Encouraging more young people into the market will ensure lower cost premiums. Younger people tend to be healthier and therefore claim less frequently – helping control the overall cost of healthcare insurance in Ireland. So it benefits us all in the long run. Hard to believe we know! More questions about LCR? Check out our dedicated LCR FAQ Page. So how does Lifetime Community Rating affect me? The good news is that if you do buy health insurance and you are over 34, the time you have held health insurance in the past is recognised against any loading that may be applied to your premium. So for example, if you had 3 years health insurance in the past with any provider, this will help lower any loading that may be applied. What if I have been out of the country or been unemployed? If you are over 34, but gave up your health insurance due to unemployment, or you have lived outside of Ireland but return, there may be reductions/waivers applied to any loadings. We can go into the detail around this for you and your individual circumstances when you contact us about buying a policy. Think back to why you had health insurance. There are probably a number of reasons why you don’t have health insurance anymore, maybe you couldn’t afford it anymore, maybe you moved job so your employer removed your cover or maybe you just didn’t see the value in having it, some of us never go to hospital, so it’s hard to see the value of your health insurance sometimes. But remember having health insurance is important to protect you and your family against the unexpected. Should you join Laya Healthcare, you will have peace of mind knowing that you’ll have quicker access to the best level of care and depending on the policy you buy, you could also get money back against everyday medical expenses such as GP costs. So that’s money in your pocket at the end of the year. There are also really good screening benefits available to make sure anything that does go wrong is caught at the earliest possible time. Find out more on www.layahealthcare.ie . More young people in the market ensures lower cost premiums. Younger people tend to be healthier and therefore claim less frequently – helping control the overall cost of healthcare insurance in Ireland. So it benefits us all in the long run. 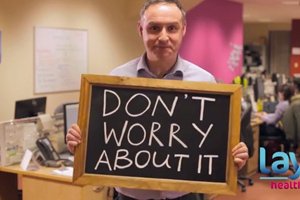 As one of our half a million members , we are delighted to tell you that you have nothing to worry about. Simply maintain your cover with us and Lifetime Community Rating won’t affect you. This applies if you pay for your own health insurance or if your health insurance is paid for by your employer. You should remember though, that if you decide to take a break from health insurance and re-enter the market over the age of 34, then loadings may apply. As you have health insurance you should know that it’s safe to switch under Lifetime Community Rating without any risk of loadings. So don’t feel like you are stuck with your current provider. We’re Ireland’s second largest health insurer and we’d love to hear from you here at laya healthcare. 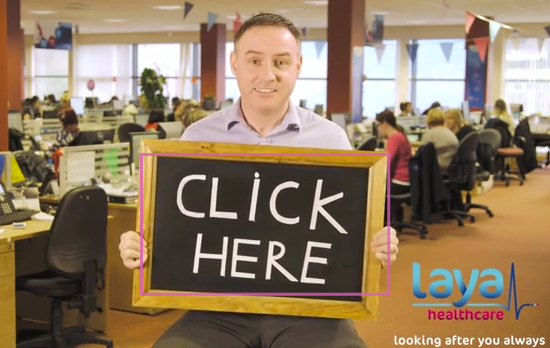 So why not join more than half a million other laya healthcare members today? 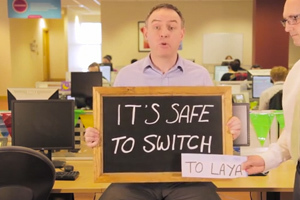 Visit www.layahealthcare.ie for more information on how you can switch. As you know a cash plan is a type of health insurance that doesn’t give you the same hospital cover that normal health insurance gives, but does give you money back on medical expenses such as GP visits, physio visits and prescriptions amongst other things. It’s important to know that if you have a cash plan and are over the age of 34, if you decide to buy full health insurance, then your time on the cash plan won’t be recognised under Lifetime Community Rating, meaning no reductions in loadings. 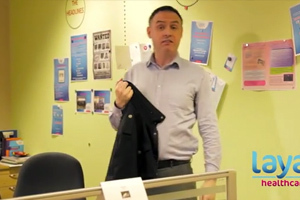 You were resident in Ireland on 1 May 2015. Lifetime Community Rating doesn’t affect you. However, if you do not currently have health insurance you should take it out no later the 30th April 2015 or before your 35th birthday. If you’re 34 or below, you won’t have to pay any extra. If you’re 37 when you first take out insurance, you’ll pay 6% (3 years x 2%) extra for your cover. If you’re 54, you’ll pay 40% (20 years x 2%) extra. It mounts up, doesn’t it? There’s a real saving if you take out your first health insurance before you turn 35. If you do, you don’t have to pay any additional premium as you grow older.